The highlight of the Two Oceans Aquarium, in Cape Town, is the 'predator tank'. Not only does the tank feature great white sharks, turtles, rays, and a variety of large fish, but you can also dive in the tank and swim with sharks! Because you need to be PADI certified to dive, we couldn't do it. There was no dive scheduled the day we went either, but it also meant the viewing area was less congested. The tank features a glass-domed hallway which allows you to view the animals as they swim right over your head! and i looovee your headband! Seriously, I think everything that lives underwater is about 9,000 times more terrifying than anything else in the history of history. I just re-read the text of your post. You wanted to go IN there?!? I love aquariums! Great pics of the sharks...they're such amazing creatures. I swam with Great Whites when I was in SA--one of the coolest experiences EVER. this looks like soo much fun except I'd probably be so scared of the sharks! great fun. I bought an old boyfriend a dive in the shark tank at AQUA here in Perth one year, he loved it. These pics are fantastic! I don't know how you find the time to travel, edit photos and post! You guys are incredible! When my 2 girls are older, we are planning a South African jaunt to CT and safari in Jo'burg! Thanks for giving us a taste of the country, since we probably won't get there until a few years from now! Wow, beautiful pictures! 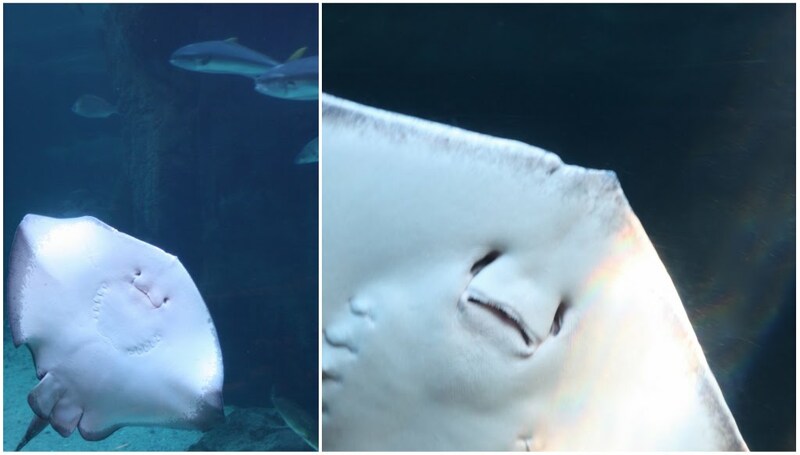 I especially love the ones of the rays, what a great view!